Mike Ashley’s Sports Direct has said it is considering making an offer to buy Debenhams outright as a way to save the ailing department store chain. But on Friday it warned that existing shareholders could be wiped out by the proposals. “In Sports Direct’s opinion, Debenhams restructuring and refinancing process is likely to result in an adverse outcome for Debenhams existing shareholders,” Sports Direct said in a statement to the stock market on Monday. 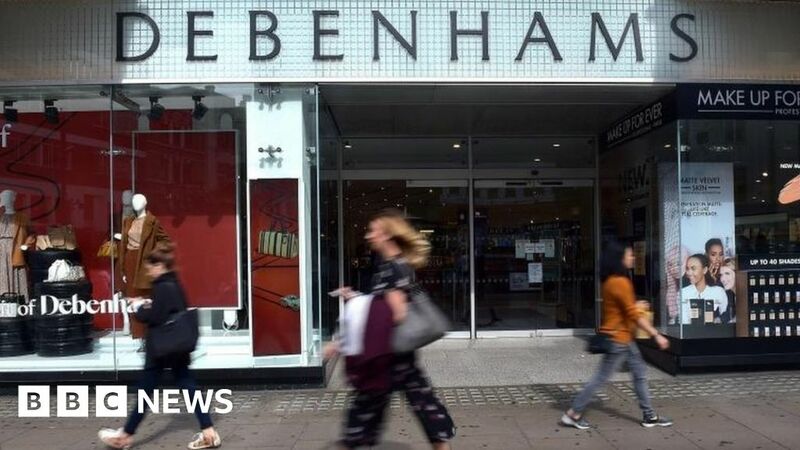 Debenhams, which has issued a string of profit warnings, is trying to renegotiate its debts and restructure the business. It has lost 90% of its market value in the last year as it struggles to adapt to the shift of shopping online and spending slowdown on the High Street. On Friday, it said it was seeking a cash injection of up to £200m from existing lenders. Debenhams has had plenty offers of help from Mike Ashley in recent days – from a £150m loan to a £100m bid to buy its Danish chain, Magasin du Nord. The offers all had one important string attached: Mr Ashley would become CEO. It’s yet another attempt to take control of the struggling department store chain. Like other shareholders, he faces being wiped out under the current restructuring plans. He wants to protect the value of his investment, what’s left of it. It’s now a battle between Debenhams’ lenders and its biggest shareholder. Right now the lenders are calling the shots. They can call in their debts if there’s a change of control, a move which would put Debenhams into administration. Some form of pre-pack administration is already an option as part of a restructuring plan to raise more money and sort out Debenhams’ financial problems. This may just be sabre-rattling by Mike Ashley. He’s getting pretty good at it. But Mr Ashley, who has a near-30% share in Debenhams, has argued that his counter proposals – including appointing himself as chief executive – offer the firm a better chance of survival. Under British takeover rules Sports Direct has until 22 April to either make a firm offer or walk away. It said any offer would likely be in cash but added that there was “no certainty that an offer will be made”.